If there’s one thing we’ve all come to agree on in terms of how Sony functions as a publisher, it’s that they’re willing to take risks. Instead of settling for riding of the high of inFamous and Uncharted, Sony has spent the last 7 years cultivating a highly diverse array of games and weren’t afraid to sink money into risky projects like Heavy Rain and Journey. This became even more clear when they set up Playstation C.A.M.P. a few years ago, which is a program that offers a way into the industry so long as you have a good enough idea. One of the most notable games to have spun off from this program is last year’s Tokyo Jungle. The most recent game that came out of C.A.M.P. is Rain, and once again, it’s a risk for Sony, but damn am I happy they took it. Rain starts off with a very simple premise. One day, a young boy notices a girl run past his window during a rainy night. However, it seems as if she’s not really there. However, before he could call out to here, a beast appears and chases her into a nearby doorway. Fearing for her safety, the boy runs in after her and finds himself trapped in a world of perpetual rain and darkness. Not only that, he finds out that going through the doorway made him invisible. While in the rain he’s still visible, but under shelter he is not. He’s not alone, however, as the world he found himself in is littered with invisible creatures. If the boy is to survive, he has to find his way home. Now, most of Rain‘s narrative is fairly basic, much like its premise. However, it makes up for that with a mixture of voiceless narration and purely visual storytelling. Every scene and every bit of narration is dripping with subtlety that much dumber game would deliver with the bluntness of a sledgehammer. It’s very much a game that plays with your emotions, but it does so with tact and intelligence. Granted, the story doesn’t have much to say, but its strength lies not in some greater meaning but in the creation of meaningful connection between two characters, with only text narration to put into words what these children are going through. Still, at the end of the day, Rain is, at its heart, an adventure game. Not in the traditional sense, as you’ll be hard pressed to find a text parser or inventory puzzle in the whole experience, but when you get down to it, it’s a series of little set pieces, be it a chase sequence, puzzle, or stealth segment. What make this work so well is the way they are tied together in such a way that the game constantly feels like a natural progression of ideas. Not once did it seem like a segment was contrived, too long, or too difficult. Helping out natural progression of ideas is the short length. Rain only clocks in at an hour or two, but this is one of those cases where I can say that’s not really a negative, as it keeps it so there’s not much in the way of repeated ideas. However, I can’t begrudge someone who would have an issue paying 15 bucks for 2 hours of content. Granted, the game is worth replaying at least once. This is because upon completing the game you unlock the option of collecting memories that are scattered around the levels, giving backstory on the boy, the girl, and the town they live in. Part of me feels like the memories could have been a part of the game from the get go, but relegating them to a second playthrough option is for the best, as it makes for a better first playthrough. Nothing breaks the flow of a story like stopping and searching every area of the world. However, you may find yourself doing that naturally, because this game is a joy to look at. Sure, it isn’t a technical marvel, but the game more than makes up for it’s Unity-engine visuals with superb art direction. Making the game stand out even more is the choice of using fixed-camera angles instead of a constant or player-controlled camera. Thanks to the fixed-camera angles, every shot of the game is beautiful to look at, be it a close up of a massive play space. Going with this design could have led to the dreaded problem of constantly running into walls during a transition, but thankfully, most transitions will place you in such as way that you’re always moving in the same direction as when you entered. Granted, using tank controls could have solved that problem in an instant, but I’ll take better level design over a worse control scheme that accommodates bad level design. As for the audio design, it is not as striking as every other aspect of the game, but that’s only because everything else is so well done. That’s not to say the audio is slapdash. It all works just fine. The rain is always there, constantly putting you at unease, and the sounds of tiny feet splashing in a puddle are great. However, it isn’t much to make it truly stand out. However, the musical score is. It isn’t the most diverse score, but the selection of tracks they use is quite effective and can really paint a picture. The stand out, however, is a version of Clair de Lune with vocals that plays during the final cutscene. The use of the song got me a tad choked up during the ending, to be honest, and that’s a great thing. Now, if it seems as if I’m being a little vague, that’s intentional. Rain is one of those games that is best discovered for yourself. This is very much a case of the less you know going in, the better. Sure, it’s entire plot could be put on a postcard, but it isn’t about that. The effectiveness of some of this game’s best scenes is ruined when you know what’s going on before you make it to them. Rain is one of the very few games where using the term “experience” to describe it does not produce eyerolls or ironic giggles. This is very much a game where there really is nothing else quite like it. If you’re willing to overcome the price-to-gametime ratio, Rain is definitely worth your consideration. 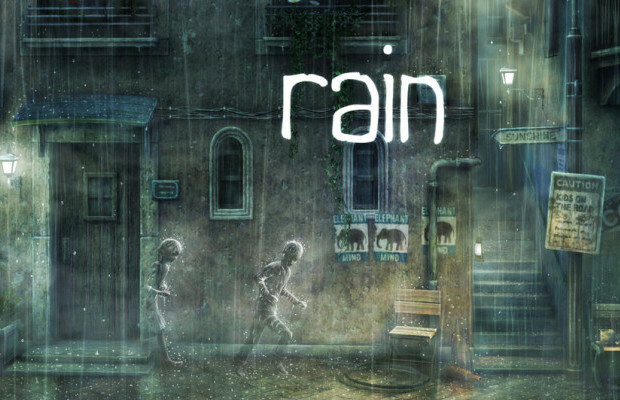 Rain was co-developed by Acquire & SCE Japan Studio and published by Sony Computer Entertainment. A code was provided for the Playstation 3 for the purposes of review.